Since we conducted our first CEO survey twenty years ago, the world has reshaped itself faster than we can reshape ourselves: from a massive increase in trade and financial flows and global online traffic to improved living standards. Inequality among countries has decreased, and one billion people have emerged from extreme poverty. Artificial intelligence, blockchain, 3-D printing, the Internet of Things, and drones are just some of the emerging technologies that are already transforming our world. A higher level of interconnectivity has raised engagement with stakeholders and forced society to think about how information is accessed and consumed. Increased transparency demands a new way of communicating, a higher level of accountability, an elevated approach to leadership, and indeed, a deeper focus on trust, purpose, and the inherent human connection that has brought us closer together. Brexit and the U.S. presidential election are two recent examples of how difficult it’s become to predict the future. Unsurprisingly, CEOs ranked uncertain economic growth and geopolitical uncertainty among their top concerns. With globalization shifting to a multi-dimensional tug-of-war among power centers, economic growth, and geopolitical threats, most CEOs are now dealing with multiple value systems, frameworks, and trading blocs. Forces like rising income inequality and accelerating digital connectivity are causing rifts and new alliances. After decades when global trade growth greatly outpaced the growth of global GDP, 58% of CEOs told us it’s becoming more difficult to balance global competition and protectionist tendencies. So how do CEOs create sustainable businesses when it’s only getting tougher to see what is coming around the bend? CEOs are focusing on strengthening their corporate purpose and collaborating with government to tackle systemic change. CEOs are also looking at a different mix of markets for expansion opportunities around the world. 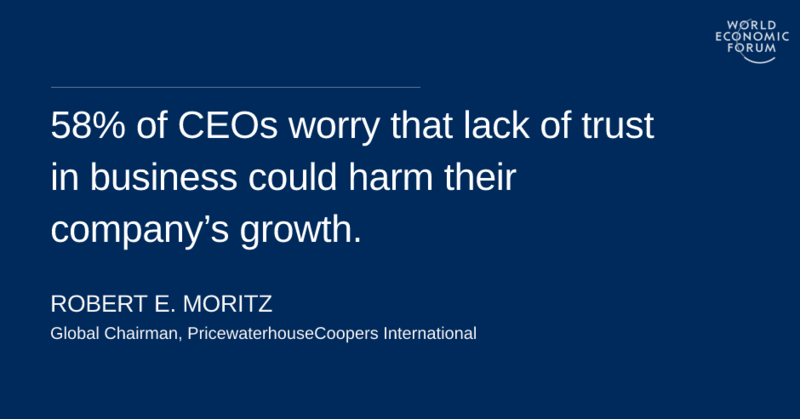 As we become more interconnected and interdependent, concern about a business trust gap has grown: 58% of CEOs worry that lack of trust in business could harm their company’s growth, up significantly from 37% in 2013. This breakdown in public confidence creates risks for individual companies, but also political, economic, and social systems around the globe. As with just about everything, technology plays a role here too. A significant number of the CEOs we surveyed are convinced that gaining and retaining trust is harder in the digital era. Notably, they also emphasize the growing importance of establishing a strong corporate purpose and reflecting that purpose in their organizational values, culture, and behavior--recognizing that the definition of trust has changed—specifically, expanded. Today, for example, to counter the risks stemming from the inevitable data breaches and cybersecurity issues, a company based on integrity and transparency will be strongly positioned to speak directly to its customers and stakeholders--both present and future--outlining all that was done and will be done to preserve data privacy. The days where the CEO of a company was rarely accessible to the end customer or was able to get sanitized feedback are gone, as are the days where the consumer had little sight into how a product was produced and a supply chain crafted. Today, executive teams need to fully grasp the ethical and moral implications of their decisions, and communicate their actions with integrity. Trust has become an equalizing force, moving power from top-down to peer-to-peer. This means that while trust is an increasingly challenging issue, organizations that succeed in earning and retaining trust have much to gain. When businesses effectively articulate their purpose, act transparently, and stand by their values, trust and success can go hand in hand. Sustained execution is key. One fact is indisputable: the role of business in society has never been more important. Hand-wringing over uncertainty will not lead to success. But leaders who step up to collaborate across sectors, borders, and markets and the public at large will forge ahead. The competition for talent is as fierce as ever, as the global population ages, the nature of work changes, and companies look for the skills they need to grow – now and in the future. 77% of the CEOs we surveyed voiced concern that skills shortages could hinder their organization’s growth, and 52% plan to hire more employees over the next year. To find these employees, CEOs are increasingly tapping into a more diverse hiring pool—and looking across borders. They are also focused on the structure and future of work, including the “gig economy,” with 28% of CEOs relying more heavily on temporary workers. A laser focus on delivering results, a drive to find the right skills, and ability to execute are what distinguish the CEOs that have higher confidence in their companies that we see in this survey. All of the above require CEOs to rethink the role of business in society, and engage with multiple players including those in government to create viable solutions. For example, many CEOs told us they struggle to define the extent of their company’s social obligations and to prioritize long- over short-term performance due to greater emphasis on shareholder value. And the events of the past year have shown us that companies that ignore people power risk stymying their growth. Giving and receiving feedback, collaborating widely, and leveraging more decentralized decision-making will all be core attributes for successful leaders as C-suites expand and boardrooms diversify. Executives who embrace this changing paradigm may well blaze a trail that reintroduces the human factor and a sense of inclusiveness, fueling growth along the way, creating opportunity, and developing a meaningful relationship with the public. Interestingly, CEOs are relatively optimistic amid the upheaval. Compared to last year, a higher percentage of CEOs said they are very confident about their organization’s 12-month revenue outlook (38% up from 35% last year). This positivity indicates that many CEOs have grown accustomed to navigating stormy, uncertain seas and are increasingly focused on opportunities created by unpredictable circumstances. Leaders that live their values and scale them will create organizations with the resilience to navigate this complex, rapid-fire, disruptive world.